Can you feel it? It’s in the air. 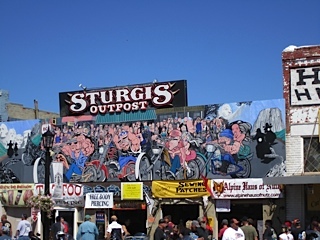 The annual Sturgis celebration (Black Hills Motorcycle Rally) is in full force. Every year, about this time I get a lot of hits on the blog from previous Sturgis articles I’ve written. Especially the 2008 article about the first shooting in 20 years between the Iron Pigs and HAMC. Last year I went to the 70th Rally (blogged it HERE) and raved about the music (except Dylan), the food, the rides and, of course, the people. I took it all in, and enjoyed every minute of it. Was it my best Sturgis ever? I don’t know what the future holds, but it was pretty good. This year had all the makings of being a major contender, but reports of the legal action surrounding the Rally trademarks and who can sell (legally) t-shirts with the name “Sturgis” along with reports about the economy has put clouds over the event. Some motorcyclists have suggested that the core H-D customer has gotten older, sold their motorcycles and become tired of the event. Some veteran riders have complained the Sturgis rally has lost its outlaw edge, attracting too many bankers and lawyers with top-of-the-line $30K+ Harley-Davidsons and not enough old-fashioned hard-core bikers. I won’t argue that the meaning and appeal of motorcycle rallies change as you get older, but I’m thinking it’s neither the economy, trademark disputes or aging demographics. Maybe Sturgis has just got…. OLD?! The event has largely remain unchanged for the last 10+ years. There are some who look forward to the Sturgis routine. They are the same people who return to the same spot year after year. They take the same riding routes. It never gets old. However, there are no easy dollars anymore especially in this new economy and it makes me wonder if there is still a place for bloated, over-commercialized rallies? Many would argue yes. I won’t be immersing myself in all things Sturgis this year. I elected to spend the time and $$ riding down Hwy 101 along the pacific coast range through the Redwoods and then over to the Sierra Nevada mountains and through Yosemite. That’s why I’ve been off line for the past couple weeks. It was time to ride, but I gave South Dakota a break. How about you. Why didn’t you attend the mother of all rallies this year? Since this was my first time there it was anything but stale to me. My wife an I went with another couple that we ride with on a regular basis. They have been twice before. We all thoroughly enjoyed ourselves both riding and going into town. The roads and scenery are spectacular and the presence of large numbers of bikes just adds to the experience IMO. Maybe when I’ve been a few times I get bored with it but it was a great experience for this first timer. As for the stats-if there were 64 bikes that crashed that means there were what maybe 190,000 that didn’t? I haven’t seen any attendance figures yet but there were a LOT of folks that didn’t crash, die, get arrested, shoot or stab anyone, etc. Thanks for your perspective. Always good to hear other POV. Cheers.